Whether you’re a new DPT graduate, a veteran clinic owner, or you fall somewhere in between, you can always benefit from a few more physical therapy marketing tips and tricks. What's a marketing plan? And how do I create one? Why does your audience need your services? What propels your audience to seek your services? Where does your audience go to learn about the services you provide? Who (or what) influences your audience's buying decisions? Have you scoped out your neighborhood yet? If not, look around. Who in your area provides similar services to yours? And think beyond physical therapy. Who offers wellness services, yoga, pilates, or chiropractic care? Then, take a look at what you provide. How do your services stack up? How do they differ? If you're having a hard time identifying what sets you apart from your competition, it may be time to shake things up and consider a new niche. Which marketing tactics will get your services noticed? When, and how often, will you market your services? What are the goals of your marketing efforts? How will you measure the success of those efforts? Where do you see your practice in a year? What about five? Download your copy of Modern Marketing Decoded: A Guide for Rehab Therapists. Enter your email address below, and we’ll send you a guide to creating a marketing strategy that actually works. Address how this marketing plan will support your overall business goals. Define your purpose: what are you trying to accomplish, and why? Detail who your audience is and what current market conditions are like. Set marketing strategies for your services. Outline your communication and messaging tactics. Explain how you're going to achieve your goals within that budget. Communicate how you plan to measure your progress. Explore opportunities for long-term marketing development (beyond what's addressed as part of your current goals and action plan). What's patient-centered marketing? And how do I do it? Taking a baseline measurement of your strengths and weakness is an effective starting point for any marketing campaign—especially one that targets patients. That’s because you absolutely must know what you have to offer before you can actually market it—and marketing something that you’re unable to successfully deliver is never a good idea. That’s particularly true when we’re talking about patient-centered marketing, because patients are significantly more likely than payers—and even other referral sources—to air their grievances about particular providers with the world. To get an accurate assessment of how your clinic is performing, collect and track outcomes data. That way, you’ll know what your clinic already excels at—and what could use a little more attention before you highlight it in your next marketing campaign. One-size-fits-all marketing strategies aren’t going to be nearly as effective as tailored messages that get to the heart of what your patients are hoping to achieve through therapy. For example, a patient with a rotator cuff injury will most likely want to know that you excel at treating that sort of thing—and the same goes for a patient with low back pain, an ACL tear, and any other condition or injury you can think of. No matter what you land on for your newly crafted message, though, be sure to support it with data—specifically, outcomes data that speaks to your successful track record. Once you’ve assessed your strengths and weaknesses and developed your data-supported marketing message, you’ve got to deliver it to your soon-to-be patients. Sure, you’ll want to train your entire staff on how to use outcomes data to market to the prospective patients they interact with on a daily basis. But, you may also want to get your message out to a wider audience—and what better way to do that than to take it online? After all, more and more patients are doing online research about treatment and provider options before making any decisions—or stepping foot in a physician’s office. You could publish the most compelling marketing copy ever written, but its impact will still pale in comparison to that of a patient review. That’s because prospective patients know you’re inherently biased about the value of your services—whereas other patients are more likely to provide well-rounded, objective feedback that paints an accurate picture of their experience. To garner the type of social proof prospective patients are looking for, you’ll want to generate an arsenal of positive online reviews on the most popular online review sites. According to WebPT’s Charlotte Bohnett—the co-host of our Top of Mind, Top of Search webinar—more than 90% of consumers peruse online reviews before purchasing a new product or service. And sometimes, a company’s Yelp page ranks higher on a search engine results page (SERP) than its actual website, which can be a good thing for small practices—if you have a plethora of positive reviews, that is. This is especially important considering that more and more patients are doing their online research before ever setting foot in a physician’s office. Once you’ve solicited quite a few positive online reviews, you can actually repurpose them as testimonials on your website and social media channels as well as mine them for valuable feedback about the patient experience—information that you may not be able to get directly from patients. To learn more about leveraging online reviews, check out this post. Looking for a super simple way to collect online reviews from your happiest patients? Schedule a complimentary tour of WebPT Reach—an EMR-integrated patient relationship management software that automates the online review collection process based on patient loyalty. What's word-of-mouth marketing? And how do I do it? Before you begin marketing your services to increase your patient volume, take a look at the type of experience you're currently providing, because your existing patients actually have a lot of influence over your marketing success or failure. How? By spreading the word, of course. And let me tell you, if your customers aren't happy, they're going to make it known—publicly. In today's Internet-centric world, there is no shortage of highly visible review outlets. And according to a recent survey from BrightLocal, people take reviews pretty seriously. In fact, 91% of study participants aged 18 to 34 reported trusting online reviews as much as personal recommendations. Many consumers also consider the number of reviews, so remember that quantity is just as important quality. That’s a huge percentage of potential customers either clamoring for your services or shrinking away, afraid that they’ll receive the same subpar treatment as their predecessors. And by the way, when we talk about the experience you’re providing for your patients, we’re talking about more than providing exceptional patient care and an interactive, easy-to-complete multimedia home exercise program. Those should be a given. Instead, we’re referring to the little things you can do to go above and beyond—to truly set yourself apart from your many competitors and give your patients a reason to tell all of their friends and family members how wonderful, caring, creative, magnanimous, and brilliant you really are. Patients are like other consumers in that they get to choose the providers from whom they seek care (albeit with some insurance restrictions). So, unless you live in a very small community where you are the only therapist around, your patients always have a choice of whether to seek your services or someone else's. However, the decision to “buy” is never a rational one. Rather, people make emotional decisions when it comes to doling out their patronage—and perception is everything. Take Coca-Cola and Pepsi, for example: In blind taste tests, most participants rate Pepsi as tasting better than Coke. However, when those same participants know which sodas they're tasting, most say they prefer the taste of Coke. Author Leonard Mlodinow explains this lack of rational thinking—a.k.a. the Pepsi Paradox—in his book titled, "Subliminal: How Your Unconscious Mind Rules Your Behavior." It’s really quite simple: people associate the Coca-Cola brand with positive emotions (think skating polar bears or cracking open an ice cold bottle of Coke at the ball game), and this, in turn, actually improves the taste of the soda. You read that right: people’s perception of an emotional connection actually influences their reality—and it’s backed up by brain imaging research. Pretty cool, huh? Just like yawning, smiling is contagious, and true smiles (ones that engage the eyes) can actually make the smiler happier. Plus, smiling communicates openness, warmth, and, according to WebMD, intelligence—all wonderful attributes for developing a positive rapport with patients. Speaking of developing rapport with patients, a good bedside manner involves more than just rattling off clinical jargon and expecting patients to follow along. Instead, really listen to your patients. Learn what they expect from therapy, what they hope to achieve, and what they're afraid of about the process. This will help you better tailor your prescribed treatment plan, home exercise program, and goals so that you both get the most out of therapy. Always focus on the bright side—especially in the presence of your patients. Speak highly of your competitors, be nice to your staff, and maintain control of your body language, your tongue, and your typing fingers. Anything that might cause your patients to rethink your kind nature or feel insecure in your presence will cultivate the opposite of the warm fuzzies (the cold pricklies?). Not only will this be less than ideal for business, but it also will be less than ideal for your patients. After all, we know that much of the recovery process depends upon the patient's attitude. And, for your continued reading pleasure, here are some more happiness-elevating tips. As a rehab therapy professional, you most likely already know the value of happy, loyal patients. After all, a patient’s attitude—as well as the patient-provider relationship—can significantly influence that patient’s recovery. It can also mean the difference between a patient dropping out of therapy early or completing his or her entire course of care, the latter of which is better for your patient and your bottom line. But, you may not know how to determine which patients are happy and loyal and which are on the cusp of bailing on you—and maybe even physical therapy all together. As far as we’re concerned, the very best tool for measuring patient loyalty—so you can improve the patient experience—is Net Promoter Score® (NPS®) tracking, which involves asking patients one simple question: On a scale of 0 to 10 (with 10 being most likely and 0 being not at all likely), how likely are you to recommend our practice to a friend or family member? Despite its simplicity, NPS—when implemented correctly and consistently—can help therapy professionals tap into a wealth of actionable data they can use to reduce patient dropout, enhance patient outcomes, and minimize litigation risk, especially if they add an optional freeform textbox to collect additional patient-specific feedback. It’s also important to note that NPS measures loyalty—not patient satisfaction—and the difference between the two goes well beyond semantics. In fact, organizations that measure satisfaction often experience a ceiling effect in that they all have relatively high scores that aren’t reflective of their patients’ actual experiences. To learn why, check out this webinar, which goes into more depth on the differences. So, what makes NPS so well-suited for helping providers quantify the patient experience—and patient loyalty? Well, based on their responses to the above-mentioned question, patients are scored and categorized into three groups: Promoters (loyal patients), Passives (satisfied but not yet loyal patients), and Detractors (dissatisfied patients). As you might expect, Promoters are significantly more likely than their Passive or Detractor peers to complete their entire course of care, complete an online review to help you reach even more patients, and come back to see you again. Thus, the goal is to move as many patients up the scale as possible by responding in real time to specific patient feedback and analyzing the information in aggregate to identify trends that may be negatively impacting the patient experience. In other words, the more Promoters your clinic has, the better. Now, NPS is easy to implement—and there’s software that can make the entire process even easier. WebPT Reach is a fully integrated patient relationship management (PRM) platform that enables rehab therapy providers to design and implement patient engagement, retention, reactivation, and referral campaigns to improve the patient experience and grow their practices. A huge component of this platform is NPS tracking. In fact, WebPT Reach automates the entire NPS process, including reaching out to your Promoters to request stellar online reviews from them. But, even if you decide to go the DIY-route to start, you’ll see huge benefits to tracking NPS—as long as you actually act on the feedback you receive, that is. Ensure your contact information (on your website, business cards, and social media accounts) is current. Use Google Docs to create an easy-to-complete patient referral form for physicians and other providers to fill out on your website. Then, include the URL on your business cards and marketing materials. Don't forget your partners, either. Take a local athletic trainer, yoga instructor, or massage therapist out to lunch and learn about him or her. Maintain these relationships, and help out where you can—they might just have the perfect opportunity to return the favor. What's digital marketing? And how do I do it? Today, the Internet is ubiquitous, and as a result, traditional marketing efforts have expanded into the digital realm. Here are some topics to consider when marketing your services online. Before you can successfully transfer your advertising efforts away from the paper-bound, non-revenue generating Yellow pages and into the more effective online methods, you'll need to know how to use keywords and your NAP. Keywords are words or phrases that individuals might type into a search engine (like Google or Bing) when looking for something online. If, for instance, someone is trying to find a physical therapist in Phoenix, he or she might use keywords like “physical therapists in Phoenix” or “Phoenix physical therapy.” For your keywords, go ahead and swap out your location for Phoenix—unless you, too, reside in the Valley of the Sun. More than 100 billion searches are conducted on Google every month, so there are plenty of new patients you can capture with a little Google know-how. First, claim your Google+ profile and ensure that it's complete and accurate—with your NAP and your website's URL. You also should include your keywords wherever you can (without making it too obvious or unnatural). You probably have a Facebook page—and maybe even a professional Twitter, LinkedIn, or Instagram account. If you don't, it's time to get on that. As with Google+, the first step to getting started with these platforms is to claim and complete your profile with your NAP, your website URL, and your keywords. No matter where you collect reviews, though, do not—we repeat: do not—generate fake ones. Your potential customers will see right through them, and there's a significant amount of technology available that's designed to expose businesses who partake in this shady business tactic. So, what do you do when you receive a review? Well, respond of course. To learn how best to respond to both positive and negative reviews, check out this post. Need some help optimizing your clinic’s online presence to reach more patients? Watch our webinar and learn four ways to help patients find your PT practice online. We're going to go ahead and assume you already have a website, because in this day and age, that's pretty standard. If not, we won't judge, but you really should get one up and running. If a potential patient can't find you online, you might appear less than legitimate, and that's not a great message for a medical professional to send. For do-it-yourself (DIY) website creation, try Squarespace or Wix—both have drag-and-drop functionality, which means you can create a site that fits your brand without hiring a developer or a designer. When designing a layout, look for formats that align well with your clinic's brand (if you're not sure what your brand is, check out this article). And while you might be tempted to go with something wild and flashy, remember that first and foremost, you are a medical professional, which means your patients expect something simple and classy. Don't worry; that doesn't mean you have to be boring or stodgy, but you should aim for something clean and compelling. Too many colors, fonts, or distracting graphics can completely throw off the look—and feel—of your site. Instead, focus on achieving balance. Choose one font style and one font color—two at most—and use interactive features sporadically to entice visitors to stay on your site. Want another aesthetic rule of thumb? 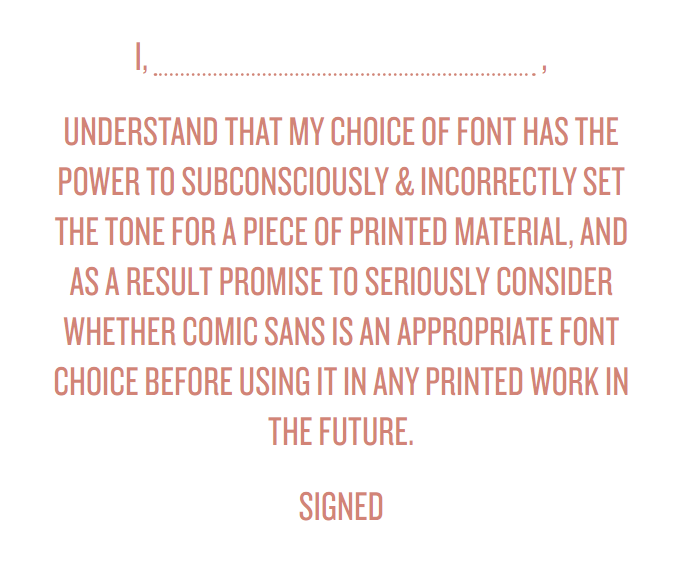 Avoid comic sans (or any other super-stylized font) as well as anything that blinks or flashes. It's never a good look, but this rule holds especially true for a professional website. Start by ensuring that your most important content (like a call to action) is above the fold (i.e., the part of a page you can see without needing to scroll). Hopefully this goes without saying, but just in case: make sure your site is working—links and all. We recommend performing regular site maintenance and quality audits and asking for feedback from your audience. Don't forget to check your site's functionality across different browsers, devices, and operating systems—like Mozilla, Chrome, Safari, and smartphones. For more information on making a great website, check out this post. Continuing education is valuable. Patient care shouldn't stop at the end of a session. Rather, you should supplement your patients' regular therapy visits and home exercise programs with wellness and prevention resources on on your blog. It's a great way to establish your expertise and increase brand awareness. Not only will your current and prospective patients appreciate your healthcare advice, but they also will grow to trust you as an expert in your field—and that's good for you and your brand. Regular, positive interaction increases loyalty. By consistently publishing valuable information—and responding to comments and questions in a timely and thoughtful manner—you'll develop lasting relationships with your audience. So the next time they're thinking about physical therapy, they'll automatically think of you—and hopefully, they'll tell all of their friends about you, too. Write and post regularly. Whether it's once a week or daily, set a schedule and stick to it. In other words, don't end up like the 65% of business bloggers who haven't posted anything new in 12 months or more. Understand your audience. You know what your patients are interested in learning—after all, it probably had a lot to do with the reason they sought out your services—so write what you know, and make sure it interests your readers. Follow other blogs. What are other PTs blogging about? What works? What doesn't? What's their style? How do they connect with their audience? You'll be amazed at how many content ideas you come up with simply by reading what others are writing. Always respond to comments. All comments are valuable—even the not-so-positive ones. So, reply promptly and professionally. Promote your content on social media. After all, the more people who see it, the better—so start talking about it on Facebook, LinkedIn, and Twitter. Be creative. Don't post the same stale stuff over and over again. Instead, get creative with your posts. Use your blog to introduce your staff members to potential patients, and try to incorporate video and graphics, if possible. Be polished. You don't have to be a professional writer to start a blog, but you should at least make sure your posts are free of errors and consistent in style. And this brings us right to our next section. There's a time and a place to use industry-specific, super-clinical terminology—and it's not on your blog (unless, of course, your audience is exclusively limited to other physical therapists). If it's not, find a different (read: simpler) way to communicate with your audience. Establish your voice and own it. After all, consistency's important. Now, that doesn't mean you can't tackle an issue from a different angle or that you shouldn't adjust your message based on the channel, but your overall tone, stance, and style should remain the same. Otherwise, you risk confusing your readers and appearing disingenuous. Whether it's Associated Press (AP), American Psychological Association (APA), Chicago Manual of Style (CMS), or one of your own making, choose a guide and adhere to it. One more writing tip: Use active voice whenever possible. If you're not sure what active voice is, check out this great Purdue OWL tutorial on the topic. This small change can have a really big impact on the clarity of your writing. There's a reason why so many bloggers fall off the proverbial wagon when it comes to actively maintaining their business blogs, and that's because many don't actually measure the effects of their efforts. Whenever you start a new endeavor—especially one related to your business—it's crucial to identify your goals and create a plan for measuring success. This way, you'll not only have a clear objective that you're working toward, but you'll also know how much your hard work is paying off. This could be something as simple as asking patients where they learned about your practice and making note of any who mention the blog. Or, you could download a free web analytics tool to track your online traffic, and then optimize your content based on what you learn. For more information on creating metrics for your blog, check out this post. What is email marketing? And how do I do it? Once you've got your NAP down and your website and blog running smoothly, it's time to move on to some more advanced digital marketing: email. According to this resource, every dollar spent on email marketing returns an average of $44.25. It seems that consumers want to receive permission-based emails instead of old-fashioned snail mail. Plus, regularly connecting with patients by sharing valuable content via email can boost patients’ engagement and active involvement in their course of care. Now, there are a few things you should do before you set out to craft a winning email marketing strategy. First, establish a HIPAA-compliant foundation by ensuring you leave any protected health information (PHI) out of your marketing communications and implementing a marketing communications opt-in form as part of your intake packet. Second, choose the right email marketing service. If you’re using an integrated patient relationship management (PRM) software like WebPT Reach, you’ll be able to send secure emails chock-full of valuable, relevant content right from the platform in order to boost patient engagement. If not, here are a few ad-hoc services to consider: Emma, Constant Contact, MailChimp, and Campaign Monitor. For a more detailed description of each, check out our Modern Marketing Decoded guide. Email collection is all about reciprocity. We know what's in it for you (a chance to market your services), but what's in it for your potential or existing customers? Hopefully, it's some really valuable and relevant physical therapy tips, appointment reminders, or even loyalty discounts. Whatever the benefits are, make sure you communicate them clearly before you ask someone to trust you with their address. Speaking of trust, it's an important factor in any relationship—and it's especially important in a client-provider one, so do not spam your patients. Instead, only send them information they want. You can do this by candidly communicating what sort of information they can expect to receive from you, so they can make an informed decision as to whether or not they wish to opt-in to your mailing list. As a medical professional, your reputation is everything. Don't risk it by doing something silly—like purchasing a list of emails, selling the ones you've collected, or failing to honor unsubscribe requests. Do the right thing and email market responsibly. Now, get to collecting emails. We recommend simply asking customers during the new patient intake process if they want to receive marketing emails from your practice. Just make sure to use a totally separate form so you're in compliance with the new HIPAA regulations. We know you've got a lot to say, but your audience's attention span for digital content is pretty short. That's why we recommend including three to five articles and only teasing viewers with two to three lines before linking to the full-length feature on your blog or website. The focal point of your newsletter will be whatever article you choose to feature, so make it relevant. You can theme each newsletter, make it seasonally relevant, or—for the more advanced email marketer—analyze your patient population and take a more targeted approach. Use your secondary article to expand your audience. For example, if most of your patients seek your services for back pain, that'd make a great feature article. But if you're interested in generating more patients looking for post-surgical rehabilitation, use this topic for a secondary post. You never know who on your email list might be a perfect candidate—or someone might find it relevant for a friend or coworker and forward it on. It's a great way to expand your network and spread the word about other, lesser-known services. It's a well-known fact that emails with a personal message outperform those without one, so be sure to include something from the heart. It can be anything—a personal anecdote, something happening in your clinic, or even some new clinical findings you've discovered. While we're on the subject of personalizing things, it's also a good idea to send your newsletter from a real person (e.g., johndoe@johndoe.com instead of info@johndoe.com). People love tips and tricks, so try throwing in a monthly tidbit of PT wisdom; it'll keep your readers engaged and coming back for more. The most effective marketing emails include a call-to-action. So, identify your goal—whether it's to increase your web traffic, boost your blog views, or drive new business—and then let your content guide your readers to that end. One final touch you can put on any good email newsletter is a click-worthy subject line. That means keeping it short (50 characters or fewer), avoiding spam triggers (words like “free,” dollar signs, exclamation points, or over-capitalization), and being direct about what content is inside. Each year, half of all adults experience a neuromusculoskeletal injury or condition and could benefit from seeing a PT. With that in mind, it’s crucial that you continue to communicate with past patients to stay top-of-mind should they—or someone they know—need your services again. Thus, consider providing past patients with super-relevant, highly valuable content such as well-written articles about preventing their injury from recurring or nutritional advice to support a high-performance athletic goal—as well as regular updates about the clinic and additional cash-pay wellness services. While you could establish a process for doing this type of engagement-boosting outreach manually, it can be very difficult to maintain, especially for growing clinics. Instead, consider adopting Patient Relationship Management (PRM) software that enables you to automate the process and ensure no former patients—or current ones, for that matter—fall through the cracks. To learn more about crafting the perfect marketing email and newsletter, click here or here, respectively. To learn how to conduct A/B testing to measure the effectiveness of your email marketing campaigns, click here. What's social media marketing? And how do I do it? Social media marketing is exactly what it sounds like: marketing via social media platforms, such as Facebook, Twitter, LinkedIn, and Instagram. In this section, you'll find an array of tips for marketing your physical therapy practice on social media sites. But first, let's remember to mind our social media manners. Align with your practice's goals and values. Support and benefit your viewers. Be respectful, considerate, and kind—regardless of how you feel personally. Be careful discussing things that may generate an emotional response. Show respect for others' opinions—even if you disagree. Never be judgemental or react emotionally. Be honest, and if you make a mistake, own up to it and apologize. Don't solicit follows or likes. Don't always be closing. Sure, you can—and should—promote your services, but do so softly and in conjunction with providing valuable content. Adhere to the terms of each social media platform as well as any group or community-specific rules. Discuss financial, legal, strategy, or any other confidential information. Give out personal information about you, your staff, or your patients (the latter's a sure-fire HIPAA violation). Talk about religion, politics, or anything else controversial. Post anything even remotely offensive. Post when overly-tired, jet-lagged, buzzed, angry, or sad. Delete comments or reviews (unless they're spam). Look into the people who follow or like your page, so you're keeping the right company and keeping your content relevant. Accept unfriending and unfollowing with grace. Proof your posts for spelling, grammar, and appropriateness. Thank everyone who follows you, likes you, or retweets your post with a personal (i.e., unique) thank-you message. For potential customers, landing on your Facebook page may very well be their first interaction with you, so make it a positive one. Everything—from your profile picture to your posts and comments—should communicate that you're personable, approachable, welcoming, and an expert in your field. Before you post anything, ask yourself if it's reflective of who you are as a physical therapist. Also, pair every post with a photo, because pictures get liked, shared, and commented on more often than standalone posts. Retweeting allows you to share what someone else tweeted with your own audience. It's a great way to intersperse other people's content with your own. And once you start generating some riveting tweets yourself, the people in your audience will be able to retweet your gems to their own followers, thereby expanding your reach. Neat, huh? Want to send a message to someone who follows you on Twitter, but don't think it's appropriate for the whole world to see? No problem. You can send a direct message by clicking the envelope icon in the top-right of your screen. LinkedIn is the social media platform for professionals. Essentially, it's an an online networking site—a way to connect with people you know in the working world and, through them, connect with others you may want to know. Needless to say, if you're a professional, you should be on LinkedIn—and if you're a practice owner, you should have a business page. Your headshot is the first thing people see when they land on your page, so make sure it represents you and your brand. You can do some really good work with the cropping tool. Even better, you can hire a professional photographer to capture your best angles. This is your opportunity to highlight your unique skills and qualifications. While LinkedIn auto-completes your headline with your current position and employer, you can change it to something that resonates better with your audience. For example, Steve Jones could have a headline that reads, “Physical Therapist at PT Clinic Y” or one that reads, “Experienced with physical therapy evaluation and treatment in areas of orthopedics, sports medicine, occupational medicine, pediatrics, and geriatrics.” Which one tells a more compelling story about Steve? That's what we thought. LinkedIn sets your default URL for you, but it typically isn't all that pretty. Good thing you can change it. Click “edit profile,” then “edit contact info,” and then “customize your URL.” Try to use something short and as close to your actual name as possible. If you have a common name, you may need to include a number or two, and that's okay. Just remember, this is a professional site. Once you've chosen a dapper headshot, crafted an impactful headline, and customized your URL, you're ready to write your professional summary. Now, this isn't the place to lay out your entire life story, but you should provide a fairly detailed description of who you are and what you do—and if you can throw in some natural-sounding keywords, even better. Looking for some summarily inspiration? Check out this page for three great examples. Now that your profile is complete, it's time to start requesting recommendations from former and current colleagues, supervisors, and patients. That way, everyone who visits your profile will know what a pleasure it is to work with you. Your recommenders can either write a brief paragraph on your behalf or simply endorse you for a specific skill with a simple mouse click. LinkedIn offers a plethora of content publication tools to help you establish yourself as a thought leader. You can create and distribute your own content directly on the site, or you can share a link that directs viewers to content you've published elsewhere. Want to take your LinkedIn networking to the next level? Join a few groups. According to LinkedIn, more than 8,000 new groups are created daily, so you'll have plenty to choose from. Once you find several that spark your interest, dive in and join the conversation. This will increase your visibility and connect you with more members who share similar interests. If you're looking for a more visual way to reach your audience, consider Instagram. Instagram is a free photo and video sharing app. (Think Facebook without text posts—just pictures and videos.) As of 2019, there are now more than 1 billion Instagram users—over 60% of whom are active every single day—liking and sharing their images and videos, making it the second most engaged form of social media after Facebook. Not only can users upload their own content on Instagram, but they also can peruse and follow other users' accounts and comment on, like, and save other users' posts. If you haven't gotten onboard with Instagram yet, here's some major incentive: many brands and businesses use Facebook to market their practice, but Facebook has become an almost solely “pay-to-play” market. And because Facebook is so popular for brands, it's become overcrowded with businesses clamoring over each other to get the audience's attention. That overcrowding also means Facebook users are more prone to ad blindness, so even if someone sees your brand's ad, there's a good chance that person will ignore it. However, there's a lot more room on the Instagram boat for businesses. In fact, only about 36% of brand marketers use Instagram, while 93% of brand marketers use Facebook (according to this resource.) On top of that, 68% of Instagrammers engage with businesses regularly, compared 32% of Facebookers. Once you've gotten your account set up, start following related accounts and get to sharing and promoting your original image-supported content. Just as you would on any other social network, use Instagram to demonstrate your brand's personality, try new things, and interact with others. We also recommend adding a “Follow Me on Instagram” button to your website. For more on how rehab therapists have found marketing success using Instagram (as well as other forms of social media), check out this article. And remember: all social media platforms have rules. For Instagram, they're pretty straightforward—essentially: be nice, credit your sources, abide by copyright laws, avoid spamming likes and follow requests, and report objectionable content. Bear these rules in mind, and Instagram will be a fantastic and fruitful platform for marketing your practice. To see six tips for being visual on social, download your free copy of the modern marketing guide today. What's pay-per-click? And how do I do it? In this case, your landing page will be the web page that you only use for those visitors who click your PPC ad. Keep it simple and free of distracting elements that take away from the main goal of the page: getting visitors to call you. All major search engines—including Google and Bing—allow you to limit your ads so they only display for users who are in your geographic area. This way, you don't waste money when someone from Chicago clicks your ad for physical therapy in San Francisco. Use A/B testing to run two or more ads with different copy at the same time in order to determine which one gets a higher click-through rate. Not only will this help you refine your messaging, but it also may lower costs, because search engines often reward ads that have high click-through rates with lower prices. Through retargeting (a.k.a. remarketing), your website visitors will see your ads after they leave your site. After all, a user who’s already been to your site is more likely to convert upon return than a brand-new visitor is. A conversion takes place when a user clicks one of your ads, arrives on your website, and performs a desired action. For example, as a physical therapist, you probably want your users to call your clinic to schedule an appointment. Once a potential patient takes that action, he or she has converted. To create a successful PPC campaign, you have to know how many advertising dollars it costs to drive that conversion. CallRail and CallTrackingMetrics are call-tracking systems that allow you to create a unique phone number that only users who click your PPC ad will see. For a list of PPC don'ts, check out this post. There you have it: how to market your physical therapy clinic. For more great info on physical therapy marketing, check out our blog here. Wondering what other strategies you can implement to improve your bottom line?